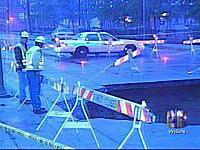 A Milwaukee street was closed Friday because of a huge sinkhole. The hole, at 35th and Juneau streets, measures around 40 feet long, 40 feet wide and about 15 feet deep. Workers investigating a drop in the area's water pressure determined a sewer had collapsed and crushed a water main.